Zirkle lists a total of 7 consistent plate varieties for this issue these are listed in the order in which they appear in her book "a." to "g.". Zirkle examined 30 full sheets to reach her conclusions and far more information about this is contained in her book. I have added some more varieties that appear in the sheet that I have ("h" to "p") these may not be consistent varieties and must be considered speculative - if you have sheets of this issue please see if you can confirm them (or not), email your results and maybe some more varieties can be recorded. a. 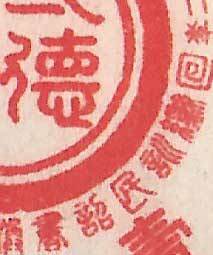 Lump on Chiao Character Variety - Mentioned by Zirkle, a lump appears on the left hand side of the Chiao character. 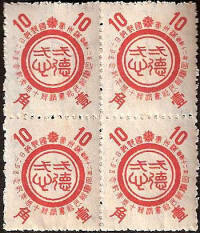 This variety appears on stamp 33 of each sheet. b. Spot on Central Character Variety - Mentioned by Zirkle, this shows a spot on the "tail" of the lower middle character. 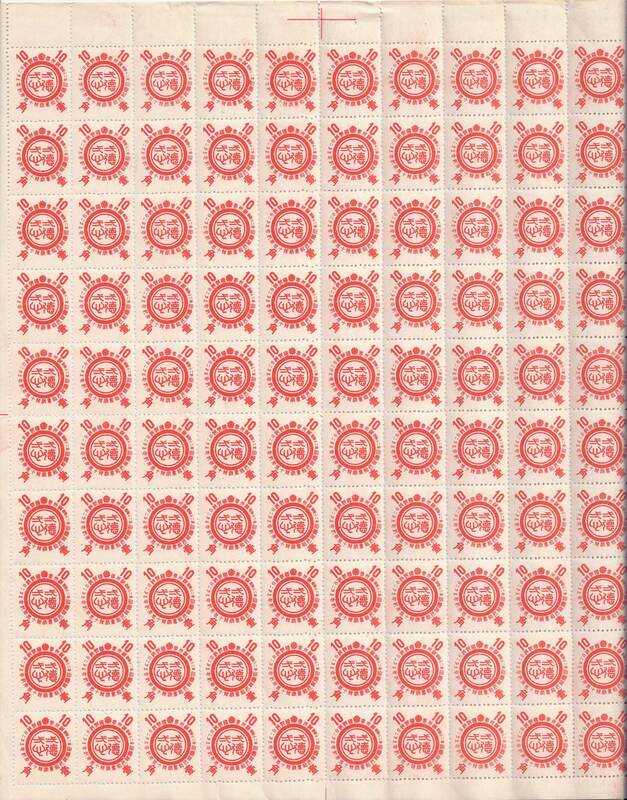 This variety appears on stamp 34 of each sheet. c. Spots Above Right Hand Central Character Variety - Mentioned by Zirkle, Self-explanatory. 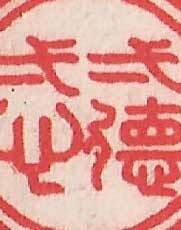 This variety appears on stamp 35 of each sheet. 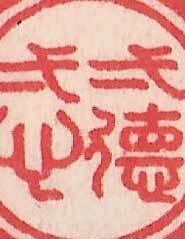 d. Red Dot Above Character Variety - Mentioned by Zirkle, This shows a red dot above a small "D" shaped character on the left hand side of the outer ring. 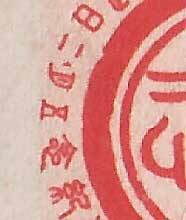 This stamp also has the "Broken Spiral" variety, (not reported by Zirkle - see "k" below). 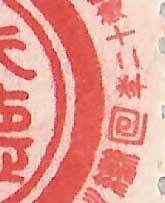 This variety appears on stamp 46 of each sheet. e. Centre line of lower left character nicked at upper intersection Variety - This is how the variety is described by Zirkle and is supposed to occur on stamp 71, however I can see no errors on that stamp. 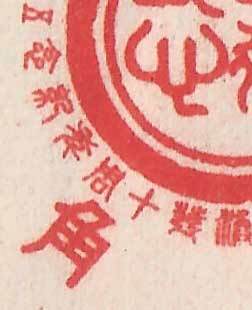 The variety shown here is from stamp 81 and shows a slight break at the intersection of the cross shaped character. Maybe a typo. f. Dot in lower left character Variety - The right hand lobe of the lower left hand character within the circle ha a dot in it. A further dot appears above this character but this is not mentioned by Zirkle in her book. 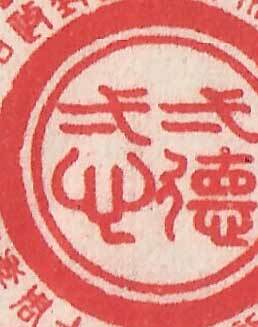 This variety appears on stamp 89 of the sheet. 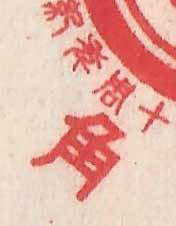 g. Extra line added to top of Chiao character Variety - Mentioned by Zirkle, a red line emerges from the curved to line of the Chiao character. 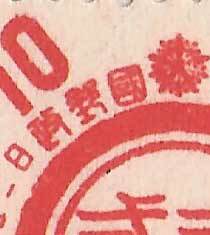 This variety appears on stamp 96 of the sheet. 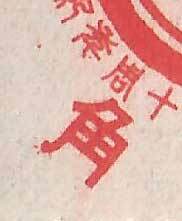 h. Red Blob on Right Hand Side of Circle (Unconfirmed) Variety - The blob links the main circle to the spiral character. This variety appears on stamp 4 of the sheet. i. White spot in lower left quadrant of thick red circle (Unconfirmed) Variety - Self-explanatory. 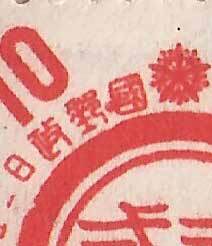 This variety appears on stamp 9 of the sheet. j. 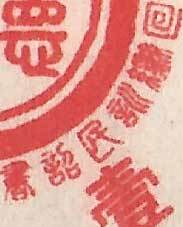 Spot on character to the left of crest (Unconfirmed) Variety - The square character has a red spot on its lower left hand side. 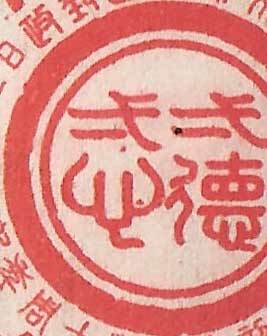 This variety appears on stamp 14 of the sheet. 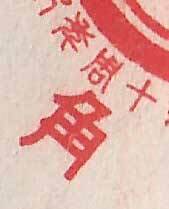 k. Broken spiral character (Unconfirmed) Variety - The spiral character loses the upward pointing tail and the character above has a line missing. 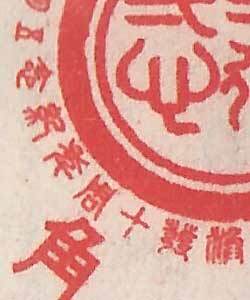 This variety appears on stamp 17 of the sheet. l. Spot on character to the left of crest (Unconfirmed) Variety - The square character has a red spot on its lower left hand side. 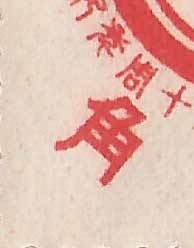 This variety appears on stamp 14 of the sheet. m. Red dot next to bottom right-hand character within the circle (Unconfirmed) Variety - Self-explanatory. 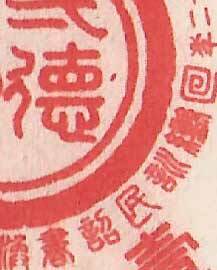 This variety appears on stamp 23 of the sheet. 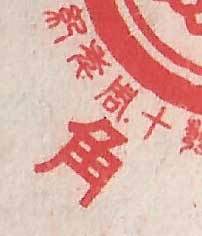 n. Blob on foot of Chiao character (Unconfirmed) Variety - The lest hand leg of the Chiao character has a red blob on the foot. 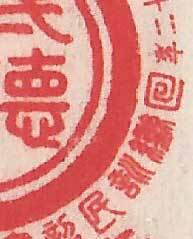 This variety appears on stamp 58 of the sheet. o. Red dot above the Chiao character (Unconfirmed) Variety - A small red dot appears in between the two characters above the Chiao character. 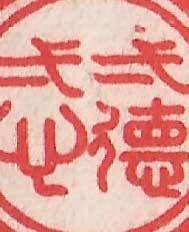 This variety appears on stamp 63 of the sheet. p. Misshapen spiral character (Unconfirmed) Variety - If you enlarge this picture you will see how misshapen the spiral character is. 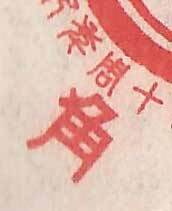 This variety appears on stamp 70 of the sheet. I have scanned the sheet that I have here at 300dpi (1.3M file), if you wish to use it as a comparison to check any varieties that you have found you might find it useful. The above examples are all scanned at 600dpi..